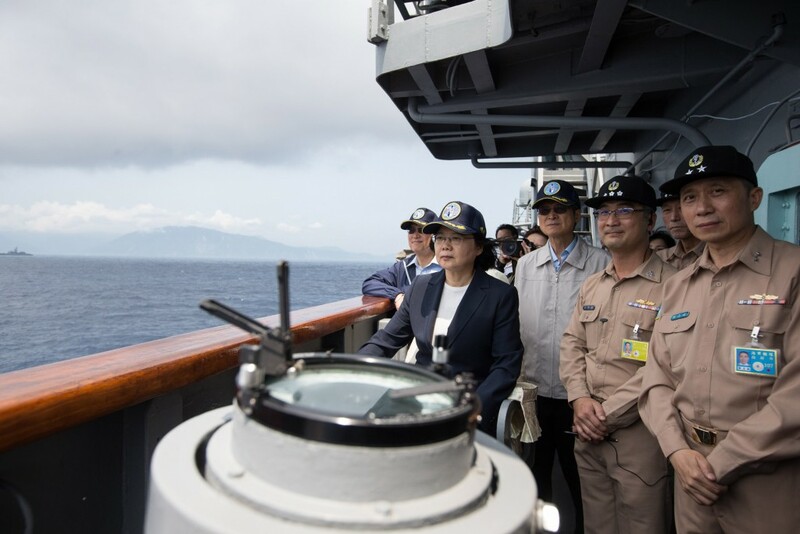 YILAN (Taiwan News) — Taiwan President Tsai Ing-wen (蔡英文) boarded the country’s Keelung- (Kidd-) class destroyer to inspect a Navy drill in eastern Taiwan Friday, but denied the inspection was a response to the large-scale maneuvers conducted by China’s military this week. This is the first time President Tsai inspected a naval drill on the water since she took office in May 2016. 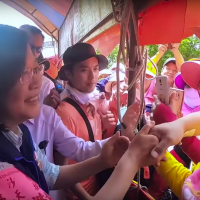 Dozens of local and foreign media, except for those from China, Hong Kong, or Macau, were also invited to board the ship and observe the drill outside the Su'ao Port in Yilan County. After nearly two hours of the military drill on land and at sea, President Tsai, accompanied by Minister of National Defense Yen Teh-fa (嚴德發), appeared on the flight deck and spoke with the media. The president denied the inspection was a response to the three-day drill conducted by China’s People's Liberation Army south of its Hainan Province beginning April 11, saying such interpretation was not accurate. “Our military is in preparation at all times. Today’s inspection was to test how the Navy has been preparing for emergency situations,” said President Tsai. “This is not a one-time test, but the beginning of a series of military tests that will be arranged in the future at suitable times,” added the president. 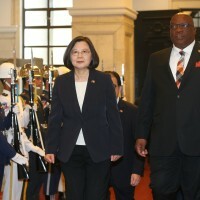 Apart from the three-day military drill on the waters off Sanya, Chinese state media Global News reported Thursday that China would conduct a live-fire drill on the Taiwan Strait near Quanzhou Bay on April 18, when President Tsai will be visiting the country’s African ally Swaziland. 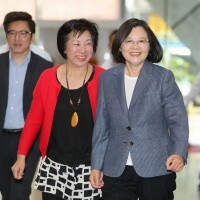 In response, President Tsai said she was confident about the military’s ability to protect the country and that she would make the visit as scheduled. “The drill conducted by China next week is a regular one, which our Ministry of National Defense has been monitoring and doing thorough preparation for. I have confidence in our armed forces, so my plan to visit Swaziland will not be affected,” said the president. For Friday’s drill, the Navy’s 168th fleet deployed 20 military ships, including a Hai Lung-class submarine, simulating that the key military facilities at the Su’ao Navy Port were attacked. The drill tested how the Navy would defend the port and counterattack the enemies on the water, all the while cooperating with armored cars from the Army and F-16 fighter jets deployed by the Air Force. However, the drill was not live-fire. Both the military ships and F-16 fighter jets fired smoke or interference bombs instead of real weapons or torpedoes. 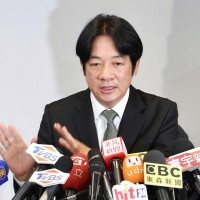 Wu Mu-chiao (吳慕樵), commander of the Keelung-class destroyer explained that the Navy did not have enough time to prepare for a live-fire drill with only one week of notice. After the drill, the president also praised the Navy for its performance. “The Navy has fully carried out the “asymmetrical military strategy”, said President Tsai, referring to the tactics revealed in the country's national defense report in 2017 as a response to China’s growing military capability.